Seriously, what is better to calm, soothe and refresh one’s spirit than a walk, (or sit 😉 ) at the beach, just taking in God’s handiwork, as He speaks to our inner most being through it? Before us is an open view of the Atlantic coast. A deep breath, for the air has changed to something that only can be understood when you’re at the sea. And suddenly… all is well… as the worries of the day quickly fade. plenty of room for walking and sand castle building. The boats moored just off shore are a fun part of the scenery. As are the coastal cottages and houses all along the beach, each sporting their own unique look. Some are fairly large, but most are small to average sized houses. Sprinkled in between the seasonal cottages are homes with year round residents. The styles vary from traditional coastal New England shingle style, to simple beach cottage styles, to contemporary styles… In our family, we all have our favorites we take note of as we walk along. but knowing the tide schedule for the day helps to know how soon your sand castle creation will be reclaimed by the sea. It is only permit parking on the streets by GRB. 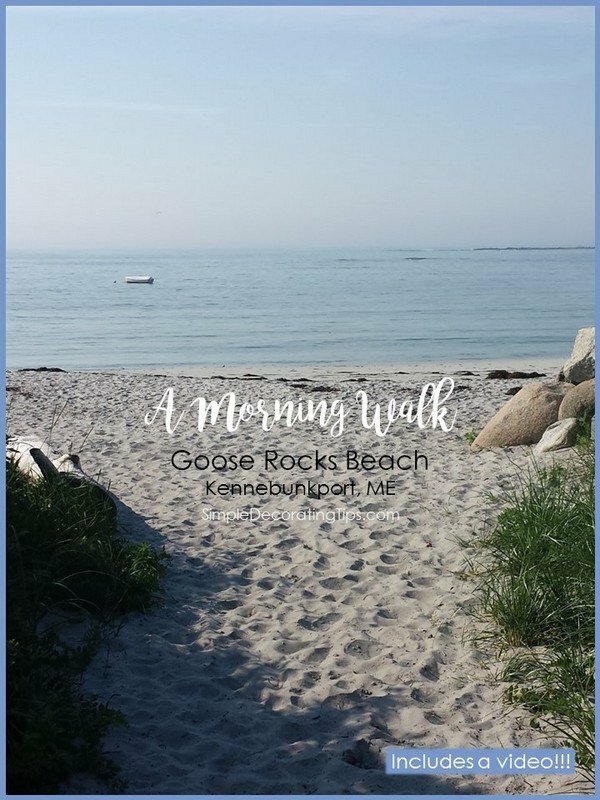 You can get a permit at the General Store by the beach, the Kennebunkport Town Hall in Kennebunkport, or at Kennebunkport Police Station, which is located between the beach and town hall. Permits are available for daily, weekly and seasonal beach parking. Click here for more info on beach parking permits. At different times of the season, there may be protected birds nesting on the beach… watch for signs marking the areas to stay clear of. Last year I was able to spot some Plover chicks. They were adorable scurrying down to the edge of the water and back to their sandy nests. But they were so tiny and blended in so well, it’s easy to understand why the nests need to be marked. Here’s a link to Maine Audubon showing a Plover chick. There is no lifeguard at Goose Rocks Beach. Dogs are welcome in the morning and evening… but not during the busy part of the day. Please feel free to share this blog with your friends, as well as on Facebook and Pinterest and now YouTube too!! Yay!! The more the merrier! Stephanie, I totally get what you mean about your soul yearning for the ocean… mine too! We live most of our days in the Midwest… our family is here so that’s what keeps us here, but in a heartbeat we’d move permanently to Maine if they all did! Liz what a great video. I can imagine myself lying on your beach with my eyes closed and taking in the melodic sounds of the waves and the birds chirping. I could easily fall asleep right there. Thank you for sharing your great photos with us and for taking us to your special destination. I certainly can see why it is so special for you. And thank you for mentioning my special place.